Tea bag folding was originally done with tea bag wrappers, hence the name. 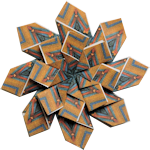 Tea bag folding consists of folding little squares of decorative paper in a specific pattern and arranging the folded pieces to form a more-or-less round motif or medallion. The finished medallion can be used for scrapbook embellishments or on handmade greeting cards. If you are looking for free teabag tiles to print, check out my Tea Bag Tile Page. Click on a medallion to view the tea bag folding instructions.